Shea Homes at Jubilee in Lacey, Washington is a resort-style active adult community open to those aged 55 or better. The community was originally started in 2004 by Jenamar but was later acquired by Shea Homes in 2010. The acquisition by Shea Homes has brought great things to an already stunning community. The natural beauty of the surrounding area includes spectacular views of Mt. Rainier and the Puget Sound, which is only a couple of miles away. With easy access to preserved forests, local shopping centers, and downtown Seattle (60 miles away) residents of Shea Homes at Jubilee can enjoy the best of both natural and urban living. Amenities are plentiful in Shea Homes at Jubilee, and are centered on the spacious Jubilee Lodge clubhouse. Residents can take advantage of the many on-site amenities and also enjoy reduced rates at the adjoining Golf Club at Hawks Prairie, which boasts two championship 18-hole courses. With an abundance of activities and social clubs, Shea Homes at Jubilee is designed to offer residents an active, satisfying lifestyle. 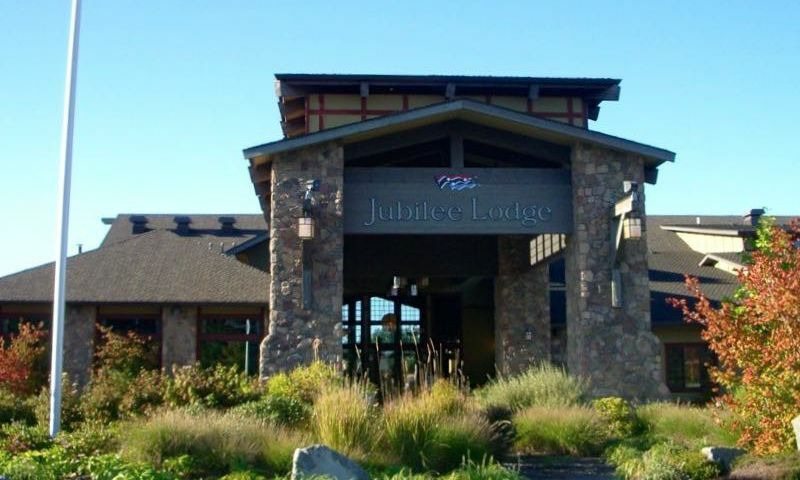 Shea Homes at Jubilee's amenities begin at the Jubilee Lodge, the 26,000 square-foot community clubhouse. Here, residents will find a large fitness center, indoor pool and spa, community lounge, activity center, multi-purpose ballroom, library, game room, arts and crafts rooms, and more. The activities continue outdoors with tennis, bocce ball, and basketball courts, as well as an elaborate outdoor trail system that winds its way throughout the community. The Golf Club at Hawks Prairie offers 36 challenging holes of championship golf with discounted rates for residents of Jubilee. This public golf club contains two full 18-hole courses: The Links and The Woodlands. Homes at Jubilee are being built to surround The Links golf course, which features spectacular views of Mt. Rainier and Puget Sound. Adjacent to Jubilee, The Woodlands is a challenging course set within the lush beauty of old-growth forests. Shea Homes at Jubilee features one-story, single-family homes that have been thoughtfully designed with active adults in mind. Starting in 2010, Shea Homes introduced 14 new single-family floor plans in homes that range from 1,285 to 2,462 square feet and offer two or three bedrooms, two or two-and-half bathrooms, and an attached two or two-and-a-half-car garage. These new models are a big hit with active adults who seek the latest luxurious finishes in a single-level home. The homes are available in five collections including the Villa, Cottage, Island, Estate, and Shea3D. Each model features an appealing exterior design and spacious open interior layouts. In addition to the new homes offered by Shea, homebuyers can select from 13 single-family home models from the previous builder, Jenamar. Their lineup included several floor plans that offered covered patios, fireplaces, window boxes, and additional garage access doors. These homes range in size from 1,277 to 2,584 square feet, and include two or three bedrooms, two to three bathrooms, and an attached two to three-car garage. Some models offer a den, flex room, or attached golf cart garage. Jenamar constructed a total of 615 single-family homes in Jubilee between 2004 to 2010. These models are available on a resale-only basis. Upon completion the entire community will consist of an estimated 1,120 homes. There is always something happening within the spacious Jubilee Lodge. This large clubhouse features many resort-style amenities, including a state-of-the-art fitness center, indoor pool and spa, social rooms, and hobby rooms. The game room includes both billiards and card tables, and the library features comfortable seating for a cozy afternoon inside. For outdoor recreation, residents can play a game of tennis, bocce ball, or basketball. Residents of Shea Homes at Jubilee enjoy many social activities, such as line dancing, card games, special interest groups, and community parties and events. Whether its the book club, water aerobics, or fishing, Shea Homes at Jubilee will have something for every interest. This comfortably sized community has an intimate feel and residents truly enjoy getting to know each other and being actively involved within the community. Jubilee is an age-restricted neighborhood located within the larger Hawks Prairie community. Located within the city of Lacey, this suburban community is only ten minutes from Olympia and approximately 60 minutes from Seattle. The community is situated near preserved forest space, yet is close to several local shopping centers and only a couple of miles from Puget Sound. Throughout the community and surrounding area, residents can enjoy breathtaking views of Mt. Rainier, which is only 40 miles away. Homeowners love being located within easy access of I-5, making it a breeze to travel to surrounding areas, such as downtown Seattle. With its prime location, Shea Homes at Jubilee enjoys both an abundance of natural beauty and all the world-class dining, shopping, and cultural attractions available in the surrounding cities. For unmatched natural scenery and an abundance of recreational options, look no further than this 55+ community in Western Washington. Jubilee Lodge - 26,000 Sq. Ft. There are plenty of activities available in Shea Homes at Jubilee. Here is a sample of some of the clubs, activities and classes offered here. The Villa Collection by Shea Homes includes two single-family home models built on home sites that are approximately 4,000 square feet. These intimate plans are ideal for homebuyers who want to enjoy the Jubilee lifestyle at a reasonable price. These two models offer 1,285 to 1,386 square feet and offer two bedrooms, two bathrooms, and an attached two-car garage. The Cottage Collection by Shea Homes includes two single-family floor plans on homes sites that are approximately 4,500 square feet. Homes range in size from 1,500 to 1,617 square feet with two bedrooms, two bathrooms and a two-car garage. The Coastal Collection by Shea Homes includes five single-family home models built on approximately 5,000 square-foot home sites. Homes range in size from 1,507 to 1,921 square feet with two to three bedrooms, two bathrooms and a two-car garage. The Estate Collection by Shea Homes includes three single-family home models that offer the maximum amount of space and luxury in the Jubilee community. These homes range from 2,186 to 2,462 square feet and offer two bedrooms, two-and-a-half bathrooms, and a two to three-car garage. Courtyards that offer ample outdoor living space, large windows to bring in light, available three-car garages and gourmet kitchens are just a sample of the features offered in the Estate Collection. The Shea3d Collection by Shea Homes offers two models to choose from that range from 1,863 to 2,132 square feet of living space. Homes feature two to three bedrooms, two or two-and-a-half bathrooms and a two-car garage. Storage is maximized with ample closets and clever solutions. These are the perfect homes for entertaining with spacious, welcoming layouts. Jenamar, the original builder of Jubilee, built 615 single-family homes before Shea Homes acquired the community in 2010. Jenamar offered a distinct lineup of 13 single-family homes that were built between 2004 and 2010. Models range from an intimate 1,277 to an expansive 2,584 square feet and offer two or three bedrooms, two to three bathrooms, and an attached two to three-car garage. These models are now available on a resale-only basis. I am a former owner/resident who sold my small home in Jubilee 2 yrs. ago because the COL in the area continued to increase and there were other issue I didn't care for. For instance, Lacey in general has seen a huge bldg. boom, which has brought lots of huge warehouses nearby (noise), more people, apt. and subdivisions, even a new middle school less than 1/2 mile away. The noise from nearby JBLM military base often become a bit much at times. They routinely are flying planes and helicopters overhead at a low altitude, and when shelling practice takes places on base...my whole house would shake. All in all....I loved the community, people, and activities when I built my home in 2005....but by 2016 the glow had worn off. FYI: friends I have kept in touch with say that although it's a sellers market there and home prices have increased dramatically....so have property taxes. One friend who only has a 2BR/2 bath home will soon be paying $10k a year. More than she paid when she lived closer to Seattle. The Jubilee trail is now open and a lovely walk to the beach or enjoying the view from the table and benches. When Shea builds the last house (soon) the income from the (approx $800) fee charged for selling a house will end. We have been told that the monthly dues will go up every year for the foreseeable future. This was something they could have seen coming and did not tell me before buying. Beautiful community, wonderful location and gorgeous view of the Puget Sound! Perfect in almost every respect. However the private path through the woods to the Puget Sound beach is closed due to a washout. Since it's a private path, the city of Lacey takes no responsibility for its repair, and the Jubilee Community Association apparently considers the project to expensive to undertake. Since the path has been, and still is, a selling point on social media, the stalemate for its fix is a disgrace. We loved Jubilee the first day we moved in and that was only a month ago. The people here are very friendly and the surrounding area are so lush and green. Lots of beautiful trails to enjoy. Wish we had discovered Jubilee sooner. Our thanks goes to our 55 Places Partner Agent! A wonderful community with great amenities. Surrounded by large pines and near Puget Sound, it's a great setting. It's in a rural area but within a few miles of urban facilities. Great tennis and pickleball courts. Quality entertainment in the huge lodge. 55places.com is not affiliated with the developer(s) or homeowners association of Shea Homes at Jubilee. The information you submit is distributed to a 55places.com Partner Agent, who is a licensed real estate agent. The information regarding Shea Homes at Jubilee has not been verified or approved by the developer or homeowners association. Please verify all information prior to purchasing. 55places.com is not responsible for any errors regarding the information displayed on this website.